Gluten Free & Allergy Friendly: Lunch Made Easy: Back to School Bento - Second Grade! 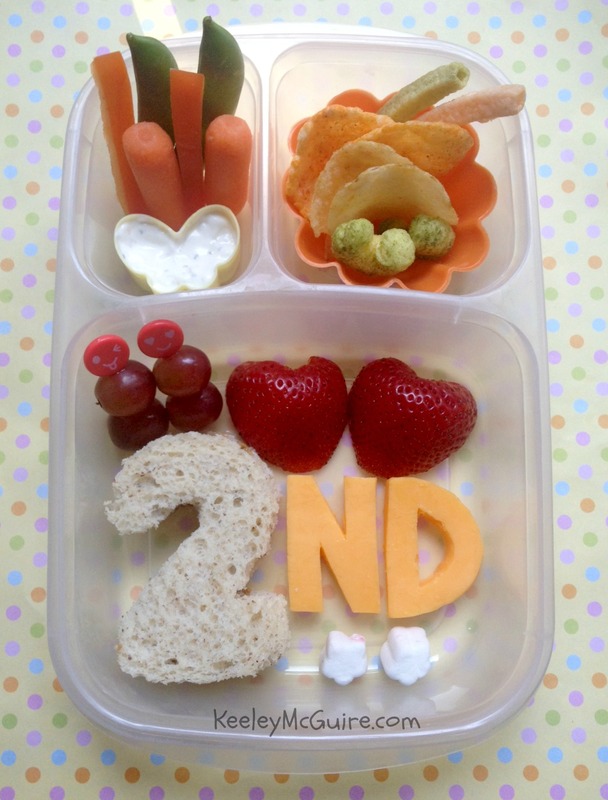 Lunch Made Easy: Back to School Bento - Second Grade! Today was only a half day but Tuesday will be there first full day so I made her a special Second Grade bento lunch to celebrate going back-to-school. I decided to have a little fun by doing almost everything in two's. Little Miss has a SunButter & honey sandwich on two slices of Udi's whole grain (gluten, dairy, nut, & soy free) bread. Her sandwich was cutout with our #2 cookie cutter from our Wilton ABC/123 Set. Using two pieces of cheese, I hand cut the "n" and "d" so it would spell out "2nd" all together. Below are two mini star marshmallows. Above are two silly face picks; Each containing two red seedless grapes. Next to them are two strawberry heart halves. Top left is a small container of dip, along with two pepper slices, two baby carrots, and two sugar snap peas. The top right is a mixtures of two each of the following: BBQ Popchips, sea salt baked kettle chips, veggie straws, and veggie Pirate's Booty. ~Ever so cute...and a great idea to do everything in two's! Love this lunch! Hope your sweet girl had a great start to 2nd grade. What a wonderful meal to start second grade with! Thank you for linking this post to the Back to School Traditions link up.